My daughter loves Harry Potter. As the federal election campaign passes the halfway point, she and I are halfway through the fourth book. As I read to my daughter every night about Professor Dumbledore preparing Harry to defend himself against dark magic, I worry British Columbians aren’t prepared for what’s lurking in the last days of election. Unlike the heroes of J.K. Rowling’s books, we can’t rely on anything comparable to the Department of Magical Law Enforcement to root out electoral dark arts. On paper, Elections Canada is supposed to serve that purpose, but their inability to reign in or prosecute fraudsters in recent elections doesn’t inspire much confidence. If only Canadians had magic wands, special powers or spells and potions to ward off dark wizards trying to undermine our democracy. Luckily, there are some common-sense steps we can take to defend our right to vote – and root out evildoers. Some may think I’ve joined the tinfoil hat brigade and am being overly conspiratorial. Perhaps. But after 10 elections as executive director of Dogwood Initiative, I’ve seen more than a few things that fuel my anxiety. Back in 2008 Dogwood witnessed what may have been the first orchestrated, high-tech, large-scale voter suppression campaign in Canadian election history. Let me take you, dear reader, to the riding of Saanich-Gulf Islands. Conservative cabinet minister Gary Lunn was in an unexpectedly tight race against a strong Liberal opponent that tightened further when the NDP candidate resigned. Polls confirmed Lunn was in serious trouble and that’s when the dirty tricks started. Residents began receiving robocalls encouraging them to cast their ballot for the NDP candidate that had resigned some days before. Lunn narrowly beat his Liberal challenger by four points. The NDP got six. Elections Canada launched an investigation of the 2008 dirty tricks in Saanich-Gulf Islands, but they hit a dead end. When they failed to enforce the law, it didn’t take a crystal ball to conclude that future Canadian elections were open season for dark wizards – back in 2009 I wrote a column predicting just that. As I prophesied in Karl Rove Comes to Canada, the 2008 shenanigans in Saanich-Gulf Islands were just a practice run. In 2011, the robocall scandal stole votes from Canadians right across the country. Michael Sona took the fall for what happened in Guelph, but even the judge who convicted him acknowledged that such a junior wizard couldn’t have done it alone. In 2013, we saw a different kind of dark art practiced by the BC Liberals en route to their surprise victory over the NDP. 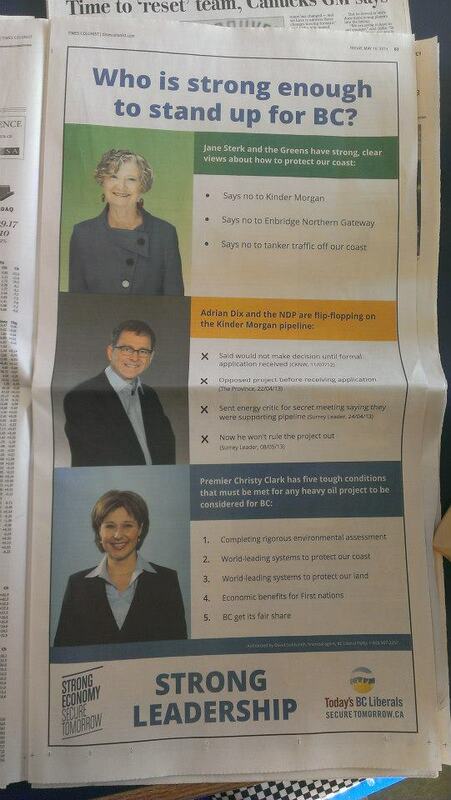 In one the strangest pieces of electoral slight-of-hand I’ve ever seen, the BC Liberals bought full-page newspaper ads in the dying days of the campaign, promoting the Green Party’s “strong, clear views about how to protect our coast”. The effect is hard to measure, but Oak Bay elected a Green MLA in a tight race with the NDP. Dogwood Initiative has also been a target of dark art tactics. During the 2014 municipal elections, Dogwood staff received panicked reports from volunteer callers. Supporters told them someone had repeatedly, aggressively robocalled them pretending to be Dogwood. We never got a recording. When we put out a call on Twitter for people to record the fraudulent robocalls, they stopped immediately. With confusion over polling locations and new ID requirements, the current election is ripe for manipulation. All political parties dabble in the dark arts, trying to confuse and discourage their opponents, but one party has better databases and more resources than anyone else. Rumour has it the Conservative CIMS database has profiles on pretty much every Canadian voter in the country. If you’ve ever signed a public petition opposing Conservative policies, liked an anti-government Facebook page or Tweeted your displeasure at a Conservative MP, they’ve probably figured out you’re an opponent. If you end up on their list of opponents, parties don’t waste time or money trying to contact you during elections. Much of their campaign happens under your radar. But in the dying days of the election you could become a target for voter suppression. That’s what happened in 2011. In the last couple weeks we’ve already received reports of fake robocalls claiming to be Dogwood. At least one person reported a call from outside the country with our name on the call display. We need to be vigilant. Because the parties fight dirty and if you are perceived to be a threat, somebody allied with one of the parties could try to confuse you, turn you against your neighbours, discredit organizations you support like Dogwood, and ultimately prevent you from casting a ballot. The election is only a few days away, so we don’t have time for years of Defence Against the Dark Arts training. If you’re like me, you don’t have a magic wand or any handy potions, but you do have very powerful magic at your disposal: your vote. Don’t waste it. 1. If you get a call saying Dogwood has endorsed candidates, it’s a lie. 2. If you get a call from an organization you’ve never heard of, look them up. 3. If you get a call saying your polling station has moved, call the police. 4. If you get strange phone calls or messages, photograph the call display and save the recording. 5. If you get a mysterious piece of mail, take pictures of both sides. 6. Inoculate yourself against confusion and misdirection on election day by going to VoteBC.ca to see independent information on your local race. 7. Go to the Elections Canada website for ID requirements and polling locations. As election day approaches you may find yourself despairing about the power of the dark arts or the state of Canadian democracy. Just remember how against all odds, a goofy, half-blood, orphaned wizard, armed with a wand and a few loyal friends, defeated the most powerful Dark Wizard in history. You’ll be fine getting to the polls.